Mix together Oreo crumbs and melted butter, press the mixture into 9” springform pan and bake for 8-10 minutes, set aside to cool. Once the crust is cooled, wrap pan with two layers of aluminum foil and bring the foil up the sides of the pan and make sure it is tight and secure so no water gets in during the baking process!!!! Add cornstarch and continue to mix until fully incorporated, decrease the speed to low and add eggs one at a time, then add vanilla extract and Baileys. Remove springform pan from the water bath and set on a cooling rack to cool, then remove aluminum foil and refrigerate (at least 5 hour or overnight). When it’s completely cooled run a thin knife around the edge and take of the ring of springform pan..
Over double boiler melt chopped chocolate until completely smooth and has no lumps, then stir in heavy whipping cream(from the fridge). 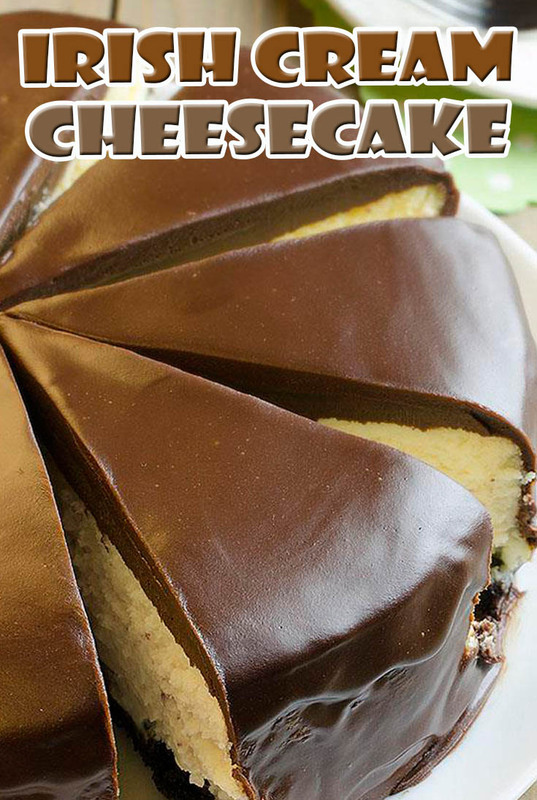 It should be very thick and creamy so you could spread it on top the cake but also on sides without dripping. Use just 2/3 of the ganache and set the cake in the freezer for 5-10 minutes to harden the ganache. Take the cake from the freezer and reheat the rest of the ganache but this time it should be smooth (but not too thin) so you can pour it over the cake to make the smooth and shiny surface.